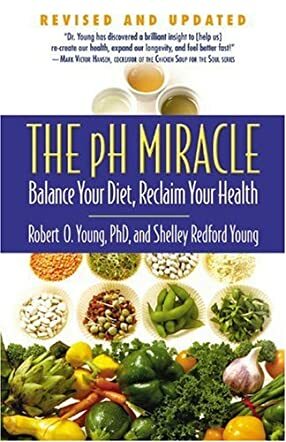 "The pH Miracle" by Shelley Redford Young and Robert O. Young is a must read. I was quite surprised and pleased to receive this audio book for review. I had recently heard about the pH diet/way to eat. The premise of this book lies in the pH balance of the body. If our pH level is off it can lead to low fatigue, digestion problems, weight gain, aches and pains, and disease. This book goes deep into topics such as core nutrients, cleansing, exercising, and alkaline food. The author also stresses the need to drink plenty of water — 4-5 liters a day, eat lots of vegetable, and take the right vitamins, minerals and amino acids. Following this program the reader should lose weight, find relief from the feeling of bloat and gas, must have an increase of energy and think clearer. It is slightly doubtful if people can follow the suggestions in this book to bring about a change in lifestyle, but it would be worth the trouble. When I first heard about the need to adjust the pH of your body it was in conjunction with fighting cancer. Cancer cells are high in acid so it makes sense that changing their pH level would help in the fight. So I wasn’t surprised at the contents of this book. This book is written in an easy to read and understand manner. This is much more than a weight loss book. It is a book that will change the lives of many. Who doesn’t want to be healthier and we can be by eating vegetables, limiting our intake of meats, and cleansing our bodies. I highly recommend this book.